The Gifford Design Group was commissioned to establish vision and direction in preparing a long term reclamation master plan for this quarry along the Blackstone River. The master plan details the closing of quarry operations, extensive water quality improvement provisions for the Blackstone River, and future establishment of a new mixed use development comprised of 300 residential units integrated with 113,500 square feet of commercial space. 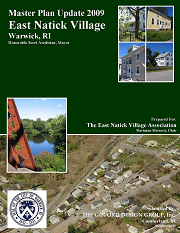 The Gifford Design Group was commissioned to provide to master planning services for East Natick Village – a Warwick neighborhood situated along the Pawtuxet River. 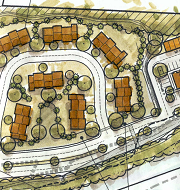 Our office reviewed the Village and created an inventory of the existing village features, opportunities and constraints. Suggestions were then outlined for various recreation opportunities (both passive and active), such as riverside pedestrian trails and small craft launch sites. The result of the master planning process was a document outlining these goals and providing suggestions as to implementation strategies to meet these goals.